TLDR: Black Friday has long been a time for increased activity for retailers in America. The day after Thanksgiving, prices are knocked down and shoppers race to the stores to start stocking up on their holiday shopping. Over time Black Friday has been extended to include Thanksgiving and Cyber Monday as well. These three days combined are expected to reach “$1.6 billion in mobile sales alone” according to Adobe’s Digital Index. North America is not the only region getting in on the action. Globalization has meant that traditions are not confined to a specific region and places like Europe in particular are making the most of Black Friday and Cyber Monday as well. This is great news because it is still a growing trend and savvy marketers will take advantage of it before competition becomes even stiffer. So, here are the top 10 things we found out from our PPC experts and client partners that you can do to make your Facebook ads even more successful. Prepare your creatives in advance: Prepare your Black Friday/Cyber Monday themes in advance. Usually, what happens is that everyone knows that Black Friday is coming and that they should do something about it but they wait until the last minute to make the ads and the creatives do not stand out as much. Instead prepare your creatives in advance so that you have solid creatives that will grab your audiences attention. Use previous ads: In terms of developing a strategy and even ads, there is no need to start from scratch. If you had a Black Friday/Cyber Monday campaign last year, look through the best performing results and double down on copy, products, and creative. If this year will be your first attempt at a Black Friday campaign, then use succesful campaigns that you ran for other special sales as a wireframe for Black Friday. On the other hand, be bold and try some new things. Doing that for your entire product portfolio may be complicated, but worry not, using Dynamic Product Ads, you can set-up templates for all your products in a matter of minutes. Test your ads: It may only be 1-4 days of advertising, depending on if you want to extend the sale through the weekend and into Cyber Monday, but you still need to test. One clever way of doing that is with dynamic creative. Dynamic creative allows you to create multiple versions of an ad and test it automatically against different audiences. The best performing combinations will be delivered to the audience that is likely to act on the ad. Therefore, you can take the best performing historical visuals, try some new ones and automatically test them on your audience. Increase ad spend: Get ready to increase your ad spend by up to 50%. Everyone will be competing for your audience. This means that their value will increase and so will the cost of reaching them. Start a little earlier: In order to edge out the competition, let potential shoppers about your sale in advance. The Wednesday or even the night right before Black Friday are perfect times to inform them. It will give them enough time to know that you will be offering a sale without cutting into your normally scheduled operations. Additionally, starting early will give the Dynamic Creative algorithm more time to learn which creative works on which audience, therefore increasing your performance. Use both Black Friday and Cyber Monday: If you are an online retailer with an offline presence then consider splitting the two events, Black Friday and Cyber Monday, or offering slightly different sale events for each. This will maximize the ROI for each of the events. Also, consider using offline conversion data (i.e. from your loyalty cards) to increase performance of your online campaigns. Get in touch with us to learn more about doing this. Integrate your marketing strategies: If you have an offline marketing strategy, then merge it with your online marketing strategy. Use the same types of images, CTA, or even refer offline customers to deals that they can only get online. Create automatic rules for your ads: Black Friday will be hectic and you might not have the time to monitor your ads every second. 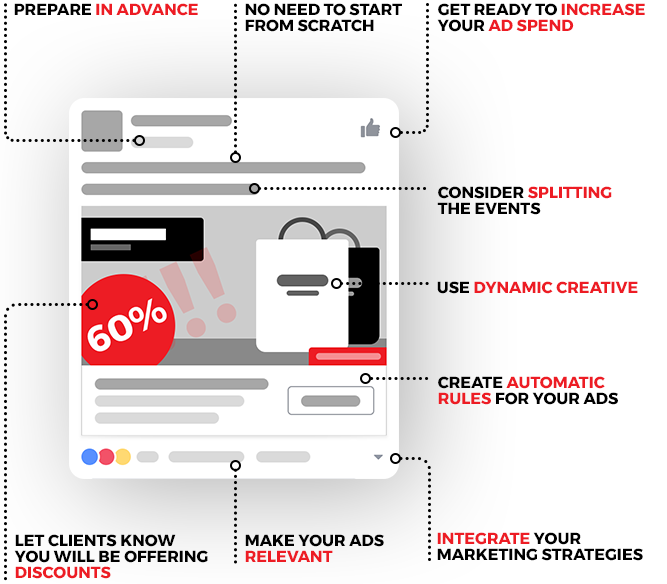 Set-up automatic rules so that you do not spend resources on ads that are simply not performing the way that you want them to and can push ads that do perform well. Top Tip: You can also set-up rules based on your Google Analytics or CRM data! See more here. Make your ads highly relevant: If you have multiple product categories that will be on sale, then split them. Target customers according to the product category that they are likely to engage with. After all, relevant ads have the best chance of being shown during this busy time. Only advertise products you still have on stock: The worst thing for customers is to click on an ad only to find out that the product is no longer available. As an advertiser, it’s bad for you as well, since you are spending money on advertising a product you can’t sell. Don’t have a product feed? Worry not, using ROI Hunter you can set-up a feed from Google Sheets. These special event sales are a great way to increase your profits, if you are willing to do the work. The competition is so fierce now that you always have to be innovative in your strategy and willing to take risks. As long as you deliver ads that are likely to resonate with your customer then you can’t go wrong. Happy Hunting! If you would like to try out some of these strategies on our platform then contact us for a free trial. Integrate your marketing strategies. If you have an offline marketing strategy, then merge it with your online marketing strategy. In order to edge out the competition let clients know a little earlier say, the Wednesday or even the night right before Black Friday that you will be offering discounts.